Born in Nice on 13 July 1927 into a family of Parisian Jews, Simone had just the time to obtain her diploma before she and her family (mother, father, two sisters and a brother) have being deported in March 1944. For her the first camp will be Auschwitz. When she was captured by the Nazis – who had established their headquarters at Hotel Excelsior in the administrative capital of the Department of the Maritime Alps – her forged documents were no use. Despite the backbreaking work, hunger and unbearable conditions in the camp barracks, 16 years old Simone – who had declared she was 18 in order to escape the gas chamber, together with her mother and her sister Milou –kept a bright appearance, and she was noticed by a Polish Kapo: “you are too nice to die here”, he told her. The three women were thus moved to the factory of the “less hard” camp of Bobrek and then to Bergen-Belsen, where her mother Yvonne would die of typhus. On 14 April 1945, when the British freed also this latter camp, Simone and her sisters Milou et Denise were the only survivors of their family. Once come back to France, in 1947 she married Antoine Veil, whose surname she would took, having three children with him. Two years later she graduated in Law. Employee at the Ministry of Justice from 1957 to 1959, she then became a technical adviser on legal issues for Prime Minister Pleven, in 1969. From 1970 to 1974 she was Secretary General of the High Council of the Bench. He did not join any political parties, but she supported the politics of Giscard d’Estaing, who appointed her Minister of Healthcare, a post she would hold until 1979. In this role, she fought for women’s rights, playing a key role in the difficult approval of the law about abortion. Mrs. Veil in facts had to face a very hard debate: a deputy even got to the point of placing a fetus under formalin on the benches of the Parliament, in the attempt to instigate more and more the conservative right wing. Neither this nor the verbal assaults against her person stopped the minister: the law which decriminalized the interruption of pregnancy would be remembered as Loi Veil. In 1979, Simone became the first woman President of the European Parliament and also the first to preside over the directly elected European Parliament. She would also run the liberal group in Brussels. Such leadership experiences in Europe gave her back partly the sense of belonging to a community and trust toward the people, which she had lost. In the 90s, for the second time, she was appointed Healthcare Minister in France. Her strength and courage were inexhaustible: she would be president and then honorary president of the Fondation pour la Mémoire de la Shoah (Foundation for the Memory of the Shoah), member of the Academy of France and of the Constitutional Council. 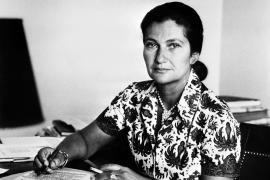 Simone Veil was a humanely, politically and culturally exemplary figure, who brought about relentlessly all the charges that she was assigned, and created an institution, which works to keep the historical memory as the basis for a better society. Since 1 July 2018, one year after her death, that occurred on 30 June 2017, Simone Veil rests in the Pantheon, where the other great men of France, including Voltaire and Zola, rest in peace.